It’s been a difficult few days if you are a Real Madrid fan. The Los Blancos are going through one of the worst patches in their recent history with losses ensuring their exit from the UEFA Champions League, Copa del Rey and making their La Liga title challenge a difficult one. But Luis Figo, one of many legends to have played for the Madrid side, insists that his former side will ‘survive’ this difficult face. “I think it’s not the moment to criticize because it was really a tough week for Real Madrid. They lost everything in one week,” said the Portuguese great who was in Mumbai for the UEFA Global Fan event. 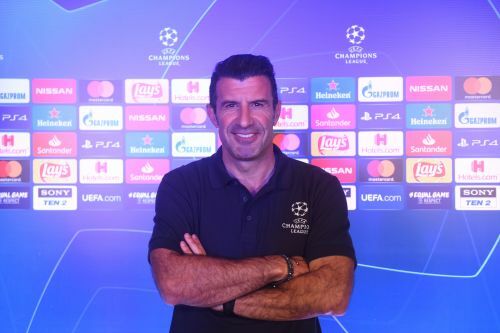 The evening also saw Figo throw light on topics like VAR, clubs spending big in the recent past and so on. It’s his decision and I don’t know what happened between him (Ronaldo) and the club (Real Madrid) that made him change clubs. He is the best football player in the World, so when he moves, of course, there will be a big impact. But I don’t know the reasons, all I can say is that Ronaldo is a great professional and is making history in football. Real Madrid is one of the biggest clubs in the world and football is like that. Real Madrid will survive without Ronaldo, yes Ronaldo is making history without Real, but that is football. VAR is part of our life. I think VAR must improve (like) everything in life. Because now in our life everyone is depending on technology and we have to adapt VAR to football in the best way possible. The biggest thing is to help the referees be fair in terms of justice (decision), but of course, if there is any new talk (problem), we have to improve like anything else in life. This is the first season that the referees are trying VAR (in Champions League) and for sure it is a positive sign. But of course, you have to define the concept of VAR and how do you use it to make the right decision. I must say that if you invest and have the capacity to invest, it doesn’t assure you that you are going to win the best club competition in the world. Of course, it will give you an advantage in terms of making your team strong, but it doesn’t assure that you will win the title. I think there will always be a balance between a team that is managed well and a team that spends. There are teams that have the financial power to buy but we have to respect the Financial Fair Play. Cryuff was one of the legendary football players and coaches in the world. One of the reasons I decided to go to Barcelona was to have a chance of working with him. Unfortunately, I could work only one year with him at Barcelona, but he left a lasting mark on my career. After 20 years, I can still say that he is with many of us, in terms of philosophy and training methods. It’s a pity that he is not there with us anymore. I always have great memories of my times with him. I think Ole is doing a great job since he came to United. I think the results are showing the work he is doing. We have to congratulate him since he became the manager. It is always ideal that financially strong clubs form (develop) players and invest in the grassroots like Ajax, Sporting Lisbon and other teams. Because what you get from sponsors and stadiums (ticket revenue) is not always enough to buy big stars, so you have to invest in the grassroots. You know, the life of a coach is very difficult because you have to always win. Everyone likes to win, but it is not always possible to win. You know Jose is a really good coach. He has won so many titles in his career. Right now, it is a moment to reflect, think and improve his ideas and probably, he will coach next year. Who me? I’m very happy working with UEFA to develop football and I don’t have a license to coach and it is very difficult without a license in today’s world (to coach). It is always difficult to put together so many superstars in a team. For us, we enjoyed those moments, those years. But we also spent moments when you don’t win. It was a mixed feeling because as football players, you can’t be happy when you are not winning. So, when you are winning, it is fantastic. Being together was a moment in football. We respect each other and the position each one of us had on the team. Because of that, we still have a good relationship. Those are some moments we can remember for all our lives. Yes, they have all the chances. In the UEFA Nations League, you can see England, Switzerland, Holland and Belgium do well. Belgium has a good generation of players, but as my generation, I think, we missed winning a title. It’s not easy to win. In terms of nations, the Champions League, just one team can win. Every nation is strong, it’s very complicated. Real Madrid's original Galacticos: Where are they now?